Buttons just didn't do it for me! I have a new love in my life, this is the break up letter, classier than a text! Dear Bernie, you promised me the world but only gave me pain. I promised myself to take it slowly, you were far from an impulse buy. Who do you think you are anyway? All that talk about sewing ‘computers’ just makes you seem ridiculous like a sewing machine posing as an otherworldly cyber thing. Since when was sewing ‘machine’ not good enough for you? We had some good times but I took you to dinner way too often. The gourmand’s satisfaction as you devoured Liberty lawn, silky things and even fairly crisp shirting made me weep. That 9mm throat of yours just swallowed its last morsel. I had actually begun to feel sorry for you, a case of Stockholm syndrome? But your enormous appetite was insatiable. You did it again yesterday, without warning, just ate everything on the plate. I don’t feel bad cheating on you now, you deserved it. You of course knew I had my odd dalliance with Rose, that swedish darling, with her irresistible simplicity. Oh, you hadn’t realised I was the type? Binary the young people call it, I’ll call it not that fussy so long as it doesn’t eat my hand. Rose and I had had a long romance that started way back, before you were a twinkle in that mad scientist’s eye. Such a lady my Rose, but as with most things, age got the better of her and she did on occasion forget herself. Of course that was why I was lured to you Big Bernie, with your promises of taking care of my every need – fiddlesticks with that. Your predecessor Even Bigger Bernie lasted less than 6 months, he was just a horrendous bully. That zipper foot programme gave me post traumatic stress disorder. I thought you were a better option, a consolation prize, but the best of a bad situation. You know what really got to me about you, the last straw? Your drunken stitch which wandered like an almost zig zag and your refusal to get started at the seam’s beginning. That had me voyeuristically watching Janet Pray on 30 second repeat just to wistfully imagine getting started with a machine as good as hers, you were supposed to be the perfect specimen, you weren’t. My serviceman promised this new fella would be completely simple, straight even. No bells or whistles, he’s not flamboyant. I did my homework, not a bad word was written about the subject of my latest affair. Lo and behold there was a gleaming pre used version on Gumtree, I held my breath and dove right in, virgins haven’t worked so well for me in the past. I first met Jan (thats a soft J like in yogging, pop culture ref.) in the back of a Mazda. It wasn’t romantic, it was cramped, but I paid less than half and brought him home with me, we hit it off straight away – I’d fallen hard. The promise of simple hard working loyalty was all I needed, Jan said he’d always be there for me. Jan the Janome 1600D – he’s straight and thats enough! Jan is the one Bernie. Yes, I revisited you the other day, you thought it was a lust to repeat our liaisons past – but essentially it came down to your zipper foot, you see Jan is yet to be shod with his. As you spluttered and just couldn’t get started I knew I’d made the right decision. You are simply not man enough for me Bernie. After the first thread nest yesterday, I realised Jan may not be as clever as you, but he is steadfast and we make a great team. My kisses, given in gratitude, linger on his glossy body. You’ve snatched my garments off me for the last time, from now on you will be the fancy man kept as a plaything. I’m not too proud to admit, sometimes a gal needs an embroidery machine… but mostly I don’t. Jan just grabs at my fabric and goes and goes and goes – he’s so fast, so powerful. He doesn’t twist his threads in a hedonistic nest when he gets nervous. His reverse is so simple and BIG. Sure his light leaves something to be desired, but we bask in our afterglow – its enough. Now for some sewing – my mostest worn summer linen dress, inspired by Handmade by Carolyn’s red gingham dress. I hadn’t realised checks could look so now! Its a bit short at the sides for my liking, but if it bothers me next summer I can add a piece there. Just the sort of easy breezy dress a gal needs to encourage the wind about her legs in 99% humidity. This adapted from a previously blogged shirt pattern. Hi Stephanie, unfortunately some of those drawings are not mine, they were done by my patternmaking teacher – I keep them for reference – the crappy ones are definitely mine! So much green and only 4 km from the city centre. I’ve worked for the past 2 years to protect that green and it looks like it will pay off! Yay!! Yes, ditch the exciting drunk and go for the simple, steadfast type. Nice dress! Thanks Marianna, one can only take so much excitement in life and a sewing machine with surprises isn’t something anyone needs. 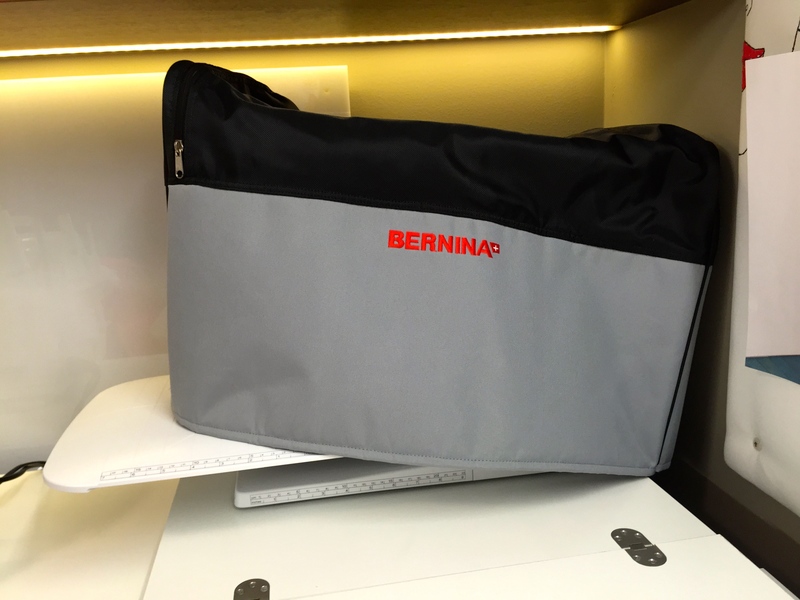 I noticed poor Kenneth D King grasping the thread tails like his life depended on it in a Craftsy class yesterday – it was also a Bernina. My grip wasn’t strong enough to stop the machine from sucking those threads down into the guts and it always ended badly! 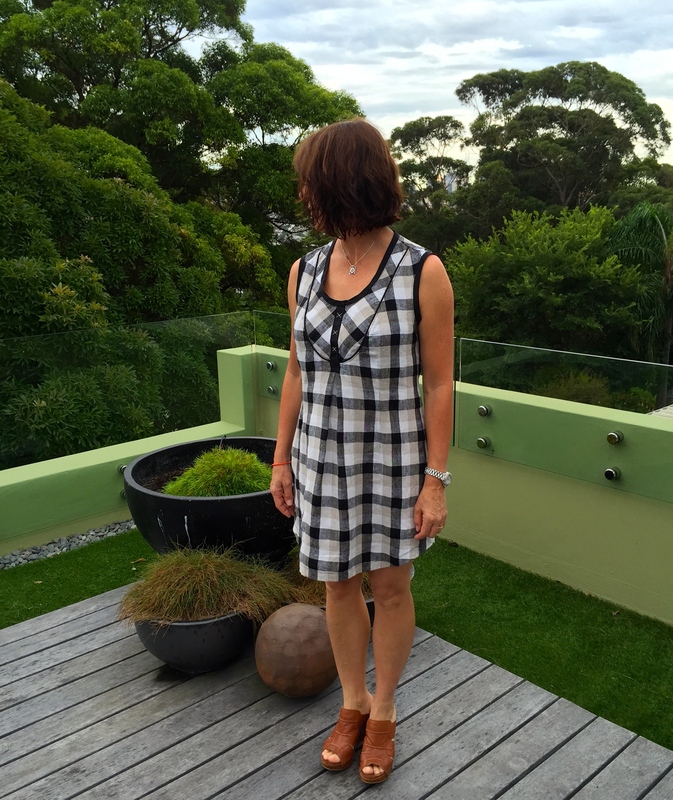 I love the big gingham – the checks are loud and not a namby-pamby school dress gingham. The beige, grey, black and white weave is also very contemporary, especially with the “alternative to buttons”. And the chucking letter is great. One day I will buy a new machine. Mine is serviceable but dull. He doesn’t do anything dreadful it’s just he seems sluggish these days. 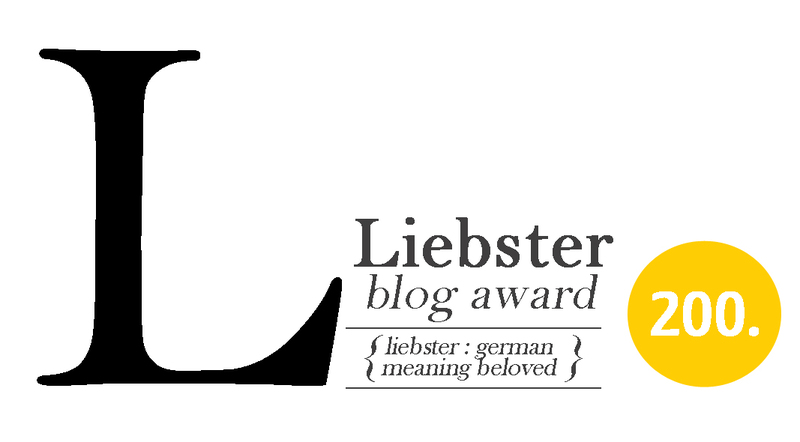 LIke Bernie he is Swiss – what more can I say? Tidy and dependable but not really that creative. I plan on finding a fast, good looking Japanese replacement – he goes by the name of Juki. Juki San was on my list too Kate. Unfortunately there aren’t many dealers in Syd. But this 1600D is faster than I could wish for. I kissed him again this morning and graciously thanked him for just being! Great letter! I take my very straightforward, very reliable (and somewhat basic) Janome to sewing classes and workshops where he suffers the disdainful glances of Bernie and Husky lovers. Nonetheless, he rolls through all the challenges – and I notice that my cussing quotient is considerably lower than any of my classmates! 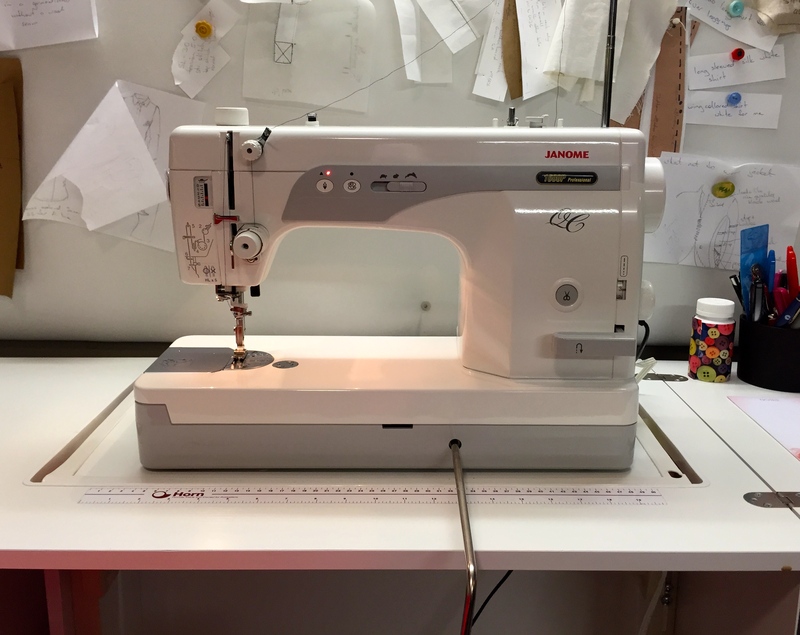 I am now so ‘rusted on’ to the Jan family that he now has both an overlocker and a coverstitch cousin – a very happy and trouble-free household that does great, tight, reliable, trouble-free stitching ! Funny you should say that because when I was forced to go back to my Bernie recently, my cussing quotient most definitely skyrocketed. Sometimes my kids ask why I sew all the time when I hate it so much!! Mmmm I know this us a bit late but I have had the same experiences with machines chewing up fabric . The best thing I did is get an old straight stitching machine which has a single hole in the plate rather than a large slot . I have happily managed chiffon , satin and other challenging fabrics on my 1958 Singer . Using the roll hemmer is a dream. I wonder if a single hole needle plate is an option with Bernie ? Hi Mem, thanks for stopping by. I use the single hole needle plate most of the time. The problem seems to be the 9mm potential. I just measured the feed dogs and they’re 1.5cm apart. So if I were using a single hole throat plate for a fine fabric, and a narrow seam allowance the fabric is no where near the feed dog and for some reason it just refuses to feed. I do wonder if this is why manufacturers are across the board adding walking feet into their arsenal. Bernie has a built in one and I use it always. Jan O’me is a basic but reliable feed! Oh, FYI I’ve also seen people put a piece of masking tape over their needle plate to simulate a single hole plate if they don’t have one, it seems to work really well.